One of the biggest potential costs you may run into when travelling is that of medical bills. If you’re not prepared and insured, medical treatment in travelling hotspots such as Thailand could cost upwards of $50,000 as echoed by TINZ. It’s crucial you’re protecting yourself in every way, whether it be with insurance or by visiting the doctor before you go. Medical costs are often the biggest setback for travellers who don’t anticipate them – and when they’re as lofty as mentioned above, it’s definitely worth trying to avoid them as much as possible. 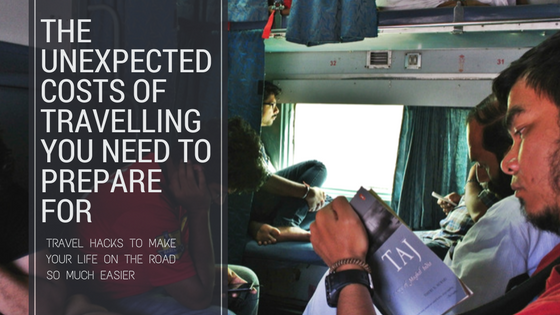 Yet another pitfall that many travellers encounter is that of the classic scam – and when travelling, it can crop up in countless different areas. Whether it be in a marketplace or a taxi, it’s important to remain vigilant and recognise a scam before you’re drained of your budget. If you do notice someone trying to scam you, particularly in a marketplace, be sure to haggle. It’s a common practice done by almost every tourist before you, and you’ll knock off a major proportion of the asking price if you’re successful. If you don’t feel comfortable paying the price, don’t pay it. How are you planning on getting from A to B? Although you might want to walk everywhere, it’s often not realistic – weather, terrain, long distances etc. – and so it’s important you’re leaving some money spare to catch public transport and make exploring your destination a whole lot easier. However, don’t get a taxi if you can help it. In many tourism hotspots, they’re dangerous and driven by scam artists – so steer clear if you have a choice. Don’t leave getting your money out until you’re abroad. Foreign transaction fees are a nasty surprise and, although they may not appear costly upon first glance, they can accumulate to take a hefty chunk out of your travelling budget. Instead, make sure you’re exchanging your money before you fly away. High streets have great outlets for money exchanging, often offering the best rates and allowing you to get the biggest bang for your buck. Shop around to find the best deals – and consider getting a prepaid travel card to store it all upon. It’ll allow you to avoid said transaction fees whilst also keeping your money all in one place. Although you might think you’ve packed it all, chances are you’ve forgotten that one thing you really need. Deodorant, sunscreen, a toothbrush – we’ve all done it. Be sure to prepare for the things you’ll be picking up along the way on your travels, as there’ll almost definitely be something you’ve forgotten. What else should your fellow travellers prepare for in terms of costs? Be sure to leave your tips and tricks in the comments below.